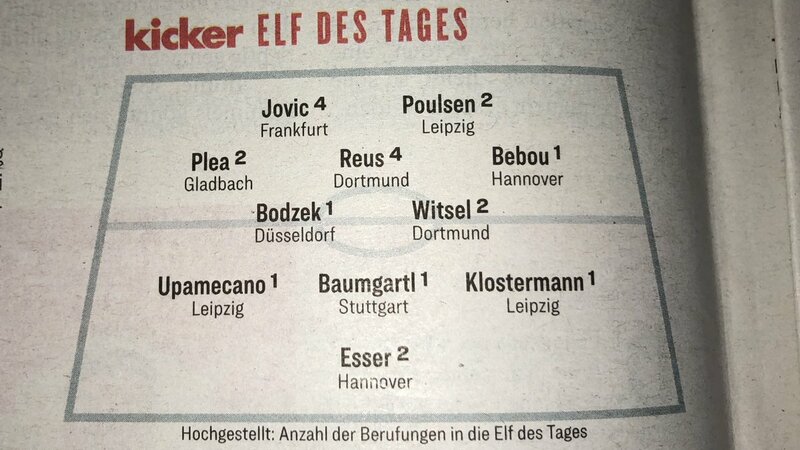 Here is the Bundesliga Team of the Week for Game Week 11, as revealed by Kicker. Six of the nine home teams won their clashes in Round 11- the biggest result of course being Dortmund’s 3-2 win over Bayern that has seen Favre’s men open a seven point lead over the Bavarians. BVB have two representatives in the team of the week (Axel Witsel and Marco Reus). Leipzig, who won 3-0 at home against Leverkusen, have three players in this TOTW in the form of Dayot Upamecano, Lukas Klostermann and Yussuf Poulsen. Reus and Luka Jovic are making their fourth TOTW appearance, while the likes of Plea, who became the first player to score an away hat trick in the Bundesliga in nearly a year, Witsel, Esser and Poulsen are on 2 appearances. Everyone else named in this Team of the Week is making their maiden appearance. Poulsen has already scored 6 goals for Leipzig this season after 11 Game Weeks, surpassing his previous all season best of 5. Here is the Bundesliga team of the week for Round 10 (Game Week 10) of the 2018/19 season, as revealed by Kicker. TOTW: Jarstein; Gunter, Ndicka, Gouweleeuw, Schmid; De Guzman, Bellarabi, Jovic, Hazard; Werner, Joelinton. Veteran manager Jupp Heynckes has moved to quell rumours that he is likely to become Carlo Ancelotti’s sucessor at Bayern. Other candidates to be linked with the Bayern job include Thomas Tuchel and Julian Nagelsmann, although the latter is thought to be a serious candidate for 2018-19, making Ancelotti’s successor more of a caretaker for the current 2017/18 season.